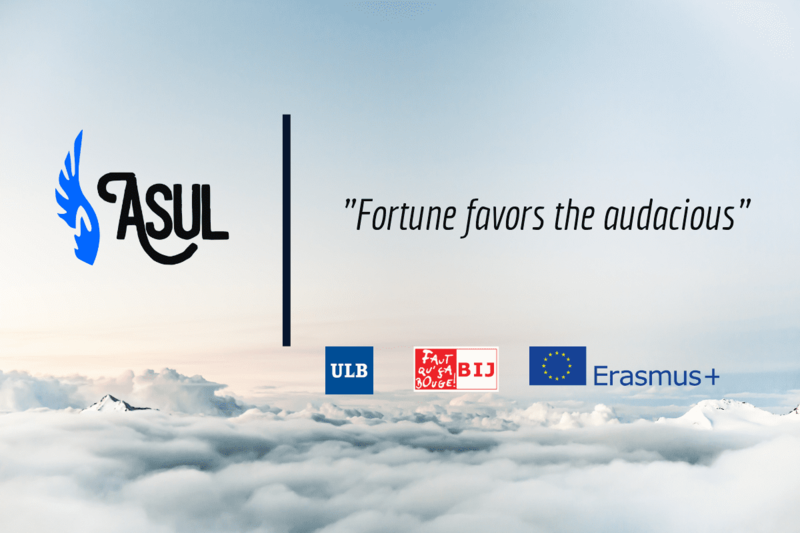 We are ASUL: a young and dynamic European association. Cooperate for the integration and awareness of the different cultures present in the university, national and international reality, in particular Latin American and Spanish-speaking countries. Encourage social, economic and cultural development through academic, national and international co-operation, particularly in Latin American and Spanish-speaking countries. Establish partnerships with other national and international associations and organizations operating in the same field of development and cooperation. The strength of this association? We are located in the heart of the European institutions and we have a strong network of contacts within universities and diplomatic representations. A former paratrooper, Jair Bolsonaro, won the Brazilian’s election in 2018. He built his campaign around pledges to crush corruption, crime and a supposed communist threat. A far-right / pro-gun / pro-torture / sexist / racist politic was elected as president of Brazil. How did this happen? The Bolsonaro was elected due to several reasons, as: corruption scandals, the disbelief in the traditional parties, the vision against PT (Worker´s Party), the Lula´s arrest, the economics issues, to mention a few examples. Several points of the Bolsonaro´s government program are open to criticism. In the education field, the current president of Brazil follows the position of Olavo de Carvalho (writer that wants to destroy the allege “cultural Marxism”, ideology that he considers harmful to the culture and traditions occidental society), and he proposes end up with the Marxists theories and gender education in the curriculum. They defend the project “Escola sem Partido”, which aims at a school free of the communist treat (it is important explain that Bolsonaro has an own definition of communism, he considers as communist threat all the positions contrary his own opinion). By restricting what the schools are ably to teaching and removing the dissent points of views, Bolsonaro menaces on of the democracy´s basis: the debate and the development of ideas. Moreover, by withdrawing gender education, Bolsonaro strengthens homophobic actions and he damages the futures generations. In the security field, Bolsonaro intends to reduce the constraints to keep and bear arms, because he believes that the solution to the Brazilian security issues is to increase the amount of weapon in the street and the numbers of death criminals, therefor, according to the Brazilian president “a good outlaw is a death outlaw”. This statement shows that Bolsonaro does not understand (or does not want to understand) that the mainly cause of the violence is not the bandits, but the inequality and the lack of public policies. To blame the bandits as cause of the violence, Bolsonaro skips of his own responsibilities. Even with this government project, Bolsonaro received about 55 % of valid votes. What was his campaign strategy? The digital media have played an important role in this context. Using the social media, Bolsonaro has built his self-image; he portrayed himself as an ordinary person that speaks directly to the population, who is capable to contest the tradition powerful people. In 2018, Bolsonaro was the candidate who best used the power of the digital media, as Facebook, Twitter, WhatsApp. Thus they constructed a strong support network, often based in fake news. Furthermore, the electoral campaign of Bolsonaro was accused of receiving illegal funding of about tens of millions of reais to a digital marketing strategy, in which youtubers produce questionable content (as videos against PT), while Twitter and Facebook were important tools for rebuilding narratives and the WhatsApp was used as the main means of the communication and as an important tool to organize the supports chain (to spread the fake news and to increase the numbers of supporters). 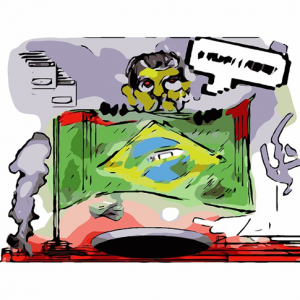 The Bolsonaro´s election highlights the powerful of the digital medias and how the professional marketing of politics strategies in digital medias can interfere in the electoral process, and thus in the democracy. Meanwhile, long before the digital media, the tradition media vehicles, as the journals, have been capable to interfere in the political position of the citizen, then: What is the innovation of the digital media? The amount of data available, what enabling the microtargeting´s strategies, and it is important to mention that the media platforms most commonly used, and which produce a huge number of data, are controlled by a few private actors. This is a new way of governing, oriented towards anticipating, formatting and selecting the future chances and actions of individuals, through the monitoring of data and metadata from their infra-personal “profiles” and more generally through computerized digital devices. Beyond the digital media, Bolsonaro was supported by four large groups: liberal economists, military, “olavistas” (Olavo de Carvalho´s supporters) and evangelicals, each with his own political interests. The question is how long Bolsonaro will be able to maintain this support base, as well as the population´s approval, and how high will be the political cost. Thatiane Moreira is Brazilian, she completed a bachelor’s degree in philosophy at University of Campinas and now she studies Political Science in the same university. During the first semester of 2019, she is an exchange student at Université Libre de Bruxelles. Antoinette Rouvroy uses the concept of algorithmic go­vern­men­ta­li­ty. She explores the po­li­tical, le­gal and phi­lo­so­phi­cal im­pli­ca­ti­ons of the com­pu­ta­tio­nal turn (Big Data, algorithmic profiling, in­dus­tri­al per­so­na­liza­t­i­on). Iván Duque, a conservative who viscerally opposes the peace accord firmed in 2016, took the largest share of the votes in the latest Colombia´s election (August, 2018), after a long and divisive campaign that was often based in the controversial peace process with leftist rebels (the Revolutionary Armed Forces of Colombia – FARC). His vanquished opponent, Bogotá’s former mayor Gustavo Petro defends the peace process. Duque has the backing of several industry leaders and, perhaps most importantly, of the ex-president Alvaro Uribe, who is still an immensely powerful figure in Colombian politic scene. Duque rebuffed suggestions that Uribe would govern through him, but it was clear during the election that the close relationship between the men helped Duque get many of the votes. Uribe, who dealt severe military blows to the Farc during his tenure from 2002 to 2010, led the campaign against the peace deal in referendum of the 2016. And, many who voted the deal down after a referendum in 2016 gave their votes to Duque. It is also important to remember that while Uribe was president, a state intelligence agency was shut down after he used it to spy on the opposition leaders, journalists and members of the Supreme Court. Moreover, his military campaign against the rebels was marked by grave human rights abuses. Both of Uribe and Duque denied the charge and accused Petro of being the real threat to democracy. According to the Colombia president, the peace accord was too lenient on drug traffickers. Meanwhile, even if he has expressed doubts about the peace deal agreed, he has not asked to overturn it. He has, though, suggested some modifications, however what concerns the politics analysts is the extend and consequences of these modifications. Many now worry about the fate of the fragile peace deal signed with the Farc in 2016, which formally ended 52 years of civil war that left 220,000 dead and seven million displaced. The popularity of the Colombian´s president decreased two months after the election, due to the issues in the security, education, health and economic areas, as well as the inability to combat the corruption. The students headed the first demonstration against Duque´s government, they required more funds for education and solution to the Odebrecht corruption scandal. Others issues have shaken the first semester Duque´s government, as: the rural violence caused mostly by organized crime (groups composed by FARC´s dissidents who do not support the peace agreement of the 2016); the end of the negotiations with the Nation Liberation Army – ELN, a revolutionary left-wing armed group involved in the continuing Colombian armed conflict; the national and international pressure given the increase in the coca´s cultivation, what pose the question about the chemical’s fumigation in the coca cultivation’s area and the severe health problems that it causes. This fumigation procedure was interrupted in the Juan Manuel Santos government, but the extremely right of the Uribe´s support group and the United States government defend the return of this method. There is still the problem about the millions of the Venezuela’s refugees which seek a better quality of life in Colombia. Duque’s job will be build bridges between Colombians divided on ideology and the peace process. 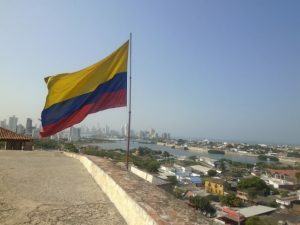 Furthermore, Colombia moved also toward others set of questions: How should the country tackle the corruption scandals that have hit Colombia, along with other countries in the region? What should be done about the rising number of Venezuelan refugees ? What must be done about rising coca production? The Colombia president has still not managed to respond these questions. Jose Luis Ramirez Bohorquez is a Colombian engineer, he has been pursuing his Ph.D. degree in electrical engineering in the University of Campinas. 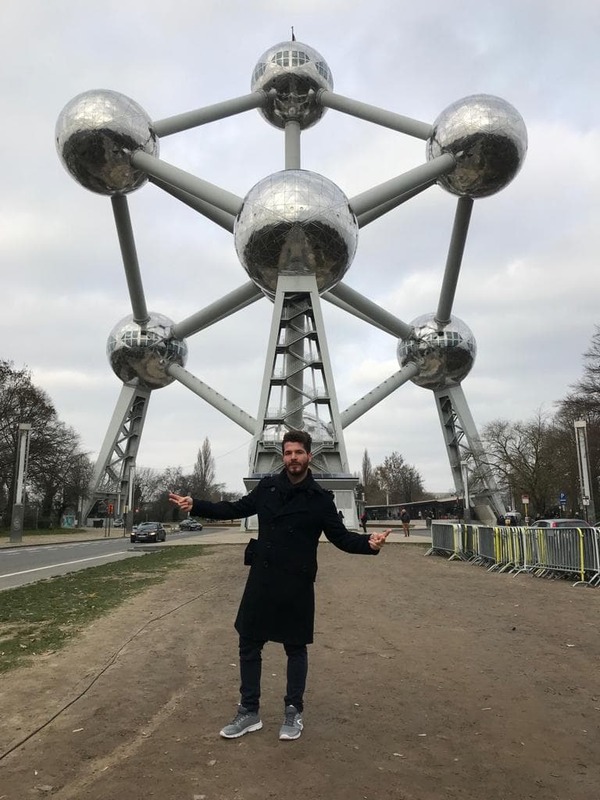 During the first semester of 2019, he works as a researcher at KU Leuven University. Latin America is an important region for the global politics. A region filled with cultures, beauties, resources, as well as economics, politics and social problems. To understand the developments in the Latin America, it is necessary to know the different fields that former theses societies and try to understand the meaning of theses events to the population. Because of that, sometimes, it is difficult to the European apprehend the complexity of some Latin America´s events. To hear what the Latin America people have to say about her/his country is a way of approach these two different worlds. So, I invite you, Latin American, to write about our country. 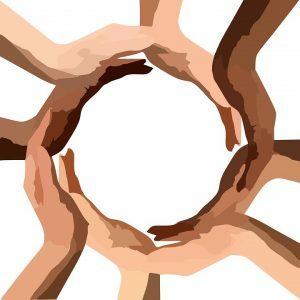 Each month, we are going to select, together, a relevant subject to write a short article, for example, “the democracy in Latin America”, “the role of the women in Latin America”, and others subjects that can be relevant. The objective is to discuss the same topic from the point of view of each country. The short articles (no longer than two pages) must be delivered by the 10th day of which month to tfoliveiramoreira@gmail.com (Thatiane Moreira), and the article can be in English, Spanish, Portuguese or French. Would you want to be part of this project? It will be a pleasure have you in our time. *Thatiane Moreira is Brazilian, she completed a bachelor´s degree in Philosophy at University of Campinas and now she studies Political Science in the same university. 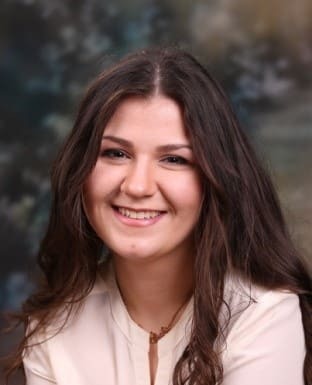 During the first semester of 2019, she studies at Université Libre de Bruxelles as an exchange student. *It is important to notice that “Latin America” does not constitute a homogeneous space, on the contrary, it includes different countries with separate process of economics, as well as cultural and social development. For being a presentation text, without academic claims, I am not exploring the complexity of the concept of “Latin America”. Last December I was more than excited to participate in an amazing project in Brussels-“EUnique Identity” along with other 5 nationalities. There are several reasons why I will remember this project for a very long time and some of them will be developed below. Maya participated in the Training Course “EUnique Identity” organized by ASUL in Brussels, Belgium. Hello Maya! Can you give us your opinion about the project “EUnique Identity” Brussels, Belgium? The project was really fun! 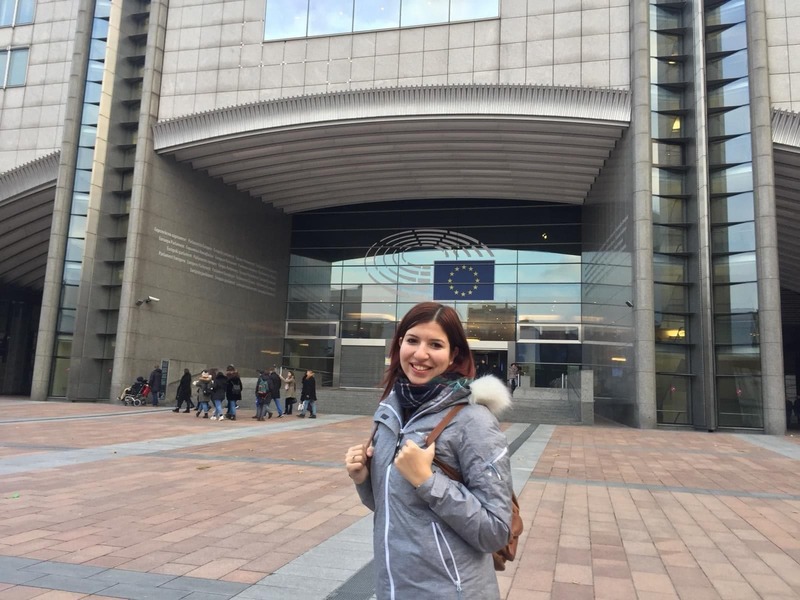 It was such a pleasure visiting the EU-Parliament and the EU-Commission! I believe it was a good experience and I got quite a lot of information about different topics connected to the EU-Institutions and what the EU is. I also think that it was good, that we also had the time to explore the beautiful Brussels. What is the most important thing you have learned during the project? I learned that there are a lot more things that the EU can provide to the young people, like different projects, traineeship programs and a lot more. I learned how important it is to actually promote more involvement in the elections of our representatives in the EU-Parliament among our fellow citizens and that we also can participate in the political life. I learned that I have a lot more to learn about the EU overall and that I should keep a closer look at what’s happening in all fellow EU-countries. Having the opportunity to visit the European Institutions was an inspiring and amazing chance to discover the wonderful mechanisms of European democracy. During this training course we had the chance to visit the European parliament, we were welcomed by a Member of European parliament and his staff that explained us how the EU works and what are the main daily aspects in the temple of European democracy and I love the fact that they make us discover by our self the key points and aspects of the European Identity. I personally enjoyed the participation in the several workshops and activities proposed. In the European commission, where we could interact with experts in different fields after having understood by our self though specific games and actions the beauty of Europe and the wide range of possibilities that all the institutions bring us. We could through this experience learn a lot about different cultures and understand how people around Europe work and live. This was a wonderful and well-organized project. I hope there will be orders and hope to come back soon in Brussels again! ASUL 2018 CREATED BY A CONTINO. ALL RIGHTS RESERVED.